Over the years, smart security camera technology has developed from the days of primitive pinhole lenses with limited ranges. These days, smart security cameras have better vision, higher resolution, and better lighting. They are capable of connecting to Wi-Fi, streaming video to your phones, tablet or computer, and sending you alerts at remote locations, if they notice movement in your house. 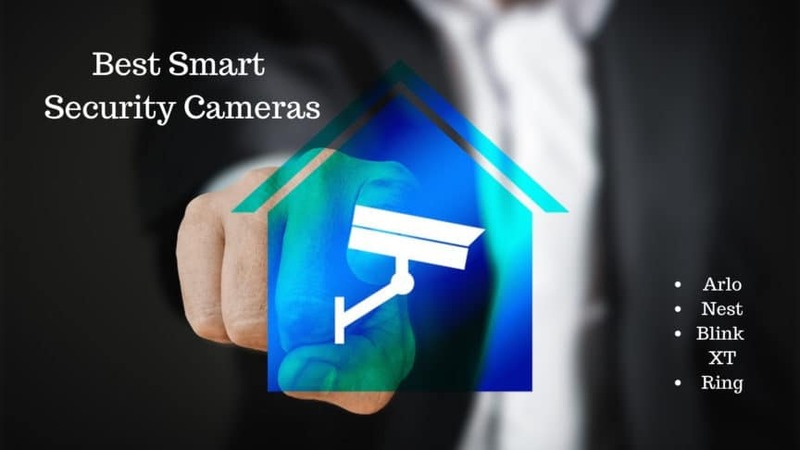 Some cameras are even capable of providing night vision, and can even connect to your other smart home applications such as your other security system and smart lights. There are a few different smart security cameras that I’ll discuss in this article. These cameras are typically considered best in breed within the smart home community. With so many options in the market, when you are shopping for a security camera here are some features you should pay attention to. How Big Is Your Camera And How Well Can You Conceal It? A camera that can be seen can be easily avoided, it is important that you choose a camera that can blend well with its surroundings in order to catch an intruder in the act. The best security cameras are cameras that are mobile and small and their locations can be easily changed depending on what you want to focus on. Is The Camera Going To Be Indoors Or Outdoors? The kind of camera that you are going to buy depends on where you want to place the camera. Usually, Cameras placed outside get exposed to rain, fluctuations in temperature and exposure to the sun. This means that they wear and tear faster than the camera to be placed indoors. They are also accessible to all so there is always the risk of vandalism. As a result, they might have protective features to protect them from the elements, and which might add to their price. If you are planning to install your camera outdoors you might want to check if it has features like weatherproofing and image stabilization, so that even if the conditions are less than ideal, such as at night, it can still record. Most indoor smart security cameras, on the other hand, don’t need these features so they are relatively cheap and there is more of them to choose from. Are You Using A Live Streaming Camera Or A Motion Capture Camera? What are you planning to use the smart security camera for? Do you just wish to capture pictures of intruders in your house? Or do you want to go a step further by being able to keep your eyes on kids, pets, and visitors in real time? Of course, you should know that live streaming cameras require a fast Wi-Fi connection and constant power supply, so you must make provisions for that when you are purchasing your smart security camera. Whether you are using a motion sensor camera or you are using a real-time live streaming camera, your camera’s field of vision is very important. The field of vision of your security camera will determine not only how you have to position your camera to achieve your aim, but also how much the camera itself can see at the time. A camera with a narrow field of vision will be able to capture less but with more detail, while a camera with a wider field will be able to capture more without you having to constantly rotate or reposition your camera. What Is Your Security Camera’s Power Source? Another important consideration of the security camera to purchase is how it is going to be powered, in fact, this is one of the most important considerations of all. If your Camera is wired, that means you are severely limited in the places you can put it in, either that or you have to install electric outlets around your house. Wireless cameras, on the other hand, can be installed everywhere around your house, but you are probably going to be spending time charging batteries and recharging them. However, in this case, the flexibility that having a battery powered camera offers you can be very useful. What Is The Camera’s Resolution? One of the most important things to consider when you are getting a security camera is the resolution of the camera itself. The resolution of the camera you will buy depends on the location the camera will be placed in. You don’t want to capture an image of the burglar entering your house only for the pictures to end up being grainy. The higher the resolution of the camera, the better it will be at capturing images over a wide area. This is perhaps the most important consideration of all when you are buying a camera, how much do you have to spend on it? Of course the more sophisticated the camera, the higher it is like to cost you. When you are looking at the price, it is important to ensure that you know what you really need, so that you don’t end up buying a costly camera when a less pricey one might be able to do as good a job. More importantly, apart from the price of the security camera itself, you should note how much it would cost to set it up and use it. If the camera requires a Wi-Fi connection, how much will it cost to constantly keep it updated on the Wi-Fi? Is it wired or wireless, how much power does it cost to maintain the batteries? How long can the batteries last before you replace them? If its software has subscription plans how much do you have to pay for it per year? What Is It’s Storage Capacity and Storage Options? Nowadays smart cameras can connect to the internet and with a PC or Smartphone app, the user can use it from anywhere. However, the thing to consider is it is storage facilities. Sometimes you are away from home for a long period of time and you are not available to review the footage captured every day. You want to make sure that it can keep a record of footage for a long period of time so that you don’t miss anything. Does the camera have access to cloud storage? What is the capacity of the cloud storage? Does it have access to USB storage? How much footage can it store? Having examined these seven features, we, have to look at the best smart security cameras in the market currently and how they accommodate each of these features. We will also be looking at the pros and cons of each so that it can help you know which one is the best fit for your house. Arlo Pro 2 is one of the most highly recommended cameras in the market right now. In terms of features the Pro 2, stands at 3.1 in X 1.9in X2.8 in, it weighs 4.8 pounds and performs optimally at a temperature of its operating temperature of -20°C to 45°C. It has a 1080p HD resolution that allows you to see around you in great detail during the day as well as 850nm infrared LEDs that can see up to 25 feet at night. If a thief or any intruders were to break into your home, the camera will be able to take high-quality videos of the intruder. The camera also has a 130-degree viewing angle. With its 130° viewing angle and its instantaneous motion and sound detection technology, no movement no matter how slight or no view no matter how far away it is can escape it. The Arlo 2 Pro also satisfies the metrics of a power source, in that it is both wired and wireless. It has a power cord and also has a rechargeable battery. This means you can place it in any location that you wish to monitor. To make it even better, when you plug your Arlo 2 Pro into an indoor power outlet, the camera’s Activity Zones and option 24/7 Video Recording feature can be unlocked. Thirdly, whether you are installing it indoors or outdoors, it has the features capable of functioning well in either place. So no matter the weather condition or the time of the day, the Arlo Pro2’s sensors will capture a clean image/video for you. Furthermore the Arlo 2 Pro has a motion and sound detector software that can be connected to your phone. This means when motion is detected (such as if an intruder breaks into the house) the camera will send the live feed directly. So wherever you are you can keep an eye on your house. It also has two-way audio. This means that you can not only listen to what is going on in the immediate vicinity of the camera, you can also talk through the camera from your smartphone. This is great for when you are watching kids and you wish to give them instructions. In terms of storage, Arlo Pro 2 is the homeowner’s dream. It has free cloud storage that keeps a recording of seven days of a motion for free. It also has a space at its base station where you can connect your USB drive to store captured footage. The Arlo Pro 2 is so versatile that it also works well with other smart devices, like Amazon Alexa IFTTT, Smart things and Stringify. Most of its users will complain about is that it is expensive, with a unit going for as high as $378 dollars online. Some of its users also complain that its base station isn’t compatible with some of its other features. If you’d like to check out more about the Arlo Pro 2, you can find it over here on Amazon. The Arlo Ultra 4k is one of the most advanced home security cameras in the market today. The camera is 3.5in X 2.0in X3.0in It has a 4k HDR Video resolution, a 180° distortion-free view, a water-resistant magnetic charging cable, and port, Integrated Spotlight for enhanced night vision. It also features two-way audio, noise canceling microphones, and a siren that can be activated remotely. It’s 4k HDR lenses not only makes the images that it captures crisp and clean, but it also allows the user to zoom in and capture more details. This means that the Arlo Ultra still captures images even in setting where pictures of other cams would be dark and washed out. To make it even better, it has a 180° distortion-free view, one of the few smart cameras in the world that can achieve that feat( most like the Arlo Pro2 above are limited to about 130°. The camera also features an Integrated Spotlight for enhanced night vision. It also features two-way audio (i.e. you can talk through it and hear what is going through it). In addition, it comes with noise-canceling microphones. As part of its security enhancements, it comes with a siren that can be activated from any connected PC or smartphone from anywhere. It is also wire free and is thus very mobile. In its own case, you do not need to use a USB Cable to charge your camera, the Camera now has a magnetic charging cable and port that is water resistant. The Con that the Ultra Users have complained about is it software. In fact, testers found the firmware complaints so widespread that the company had to move its release date forward by two months. Also, it was discovered that when the camera is being used from a remote location it cannot stream beyond 1080p even if the internet connection is fast enough. It also has been discovered that its streamed 4k HDR images and videos cannot be stored in the cloud because they are too heavy. You have to use the micro SD slot at the base station. The Arlo Ultra is also a bit pricey as far as smart security cameras go. However it does come with a free subscription to the Arlo Smart Premier service for a year, but which will cost around $119 after the first year. If you’d like to see more reviews of the Arlo Ultra 4k cameras, then you can check them out over here on Amazon. The Camera is a small square, measuring 3 in by 3in in length. It is extremely lightweight. With a resolution of 720p it can capture 7.5 frames per second if the lighting is low and nearly 35 frames per second if the lighting is good. The camera works in temperatures as low as -4°F to temperatures as high as 113°F. It is wireless and does not need a connection to any power source. This makes it great for outdoor use. It is also very lightweight and is thus very easy to mount up. It takes an average of about ten minutes to actually mount it. For the homeowner that is looking for function over form, this is the security camera for you. Its waterproof body means condensation and the elements cannot affect the camera, with many people reporting that rain and snow blew against the camera yet it is still continued to function. It is also versatile, in that it is able to work with the blink app in both Android and IOS, and the Blink app is intuitive and easy to use. The third good thing about the Blink XT camera, which will surely make homeowners happy, is that it is cheap. You can own one for only $130. This price also includes cloud storage. The user gets 7,200 seconds of footage before new footage stores over the old one. In comparison, the Ring Camera’s storage starts a $3 dollars while the Arlo Series premium plans start from $99 a year. Because it is a basic camera, its imagery and resolution are not particularly great. If you expect this camera to record live footage, you will be disappointed. Even with porch lights, its videos can come out as fuzzy. Even in the afternoon, the camera is prone to keyhole distortions. But I find that with mine if I keep the lens clean it reduces the problems and I typically only clean the lens about once or twice a year. Unlike other cameras the Blink XT does not feature a siren or two-way communication, so you cannot sound an alarm if anything goes wrong. Its maneuverability is also a problem, especially as you cannot pan, tilt or zoom with the app or remotely. It can only be done manually. Its lack of flexibility can be a problem if for instance you have screwed in the base and you find that you need to move it later. We’ve long been a fan of the Blink XT Cameras on this blog and they have served my needs rather well. If you’d like to check out more about Blink XT, you can find them over here on Amazon. This smart network surveillance outdoor camera requires a wired connection. The device is 4.96in X 2.72 in X2.99 in. It is an outdoor camera that comes in black and white colors, features a 1080p lens, Infrared LEDs, Day and Night functionality. It has its own 20-foot power cable that can plug into any electrical outlet around your house, built in siren and motion sensor. If you are looking for a camera that is functional as opposed to the one that is beautiful, then this camera is for you. Its robust, compact and weather resistant build makes it the absolute camera for the outdoors. It has an IPX rating of 5, which means it is capable enough to withstand the assault of the elements. Testers have even mentioned that the camera is rugged enough to survive a light dousing with water. For a camera with its selling point is what it can do rather than what it looks like, the Camera has an upright rectangular shape that makes it look modern and elegant. For its price, it comes loaded with features. The camera offers an integrated spotlight for night vision, a siren that can be activated and motion detection capabilities. It is also easy to install and typically takes about 10 to fifteen minutes even for novices. Its app is also versatile and easy to use. The Ring App has allowed you to view a live feed or recorded clips, review your motion alert settings and to use the integrated microphone and speakers to communicate. It also has a 140% field of vision and manual controls of the camera lights and activation of the 110-decibel alarm. If you have a problem with wires dangling all around the house then you may not like this camera. Also, the fact that it a wired camera means its flexibility is limited and you need a constant source of power supply to use it. Users have also reported that the camera tends to stall when editing motion zones which can make it a pain for reviewing footage. The third con of the Wired Ring Camera is that for you to be able to do video recordings you need to subscribe to the service which starts from $5 dollars. If you want a camera that is cheap and easy to install and use, with a comprehensive array of features to secure your home then the Ring Spotlight Wired Camera is for you. If you’d like to check out the reviews or more technical specs you can find it over here on Amazon. This camera is the wireless version of the wired camera mentioned above which means it packs all beautiful features of the wired version (as well as its cons). However, unlike the wired version, it is not a strictly outdoors camera, its flexibility means it can be moved anywhere. Like the wired version this camera also comes in black and white colors. It is capable of operating in temperatures as low as -5°F to Temperatures as high as 120°F. Since it is wireless, this version features an adjustable mount and a quick release battery cap that allows you to charge your camera without moving the device. It also has the same kind of on-demand videos and its app is iOS, Android, Mac, and Windows compatible. Like the wired version, it is also easy to install typically takes about 5-10 minutes for the typical home improvement enthusiast. The biggest con that users have reported is that the camera tends to stall when editing motion zones which can make it a pain for reviewing footage. The second con of the Wired Ring Camera is that for you to be able to do video recordings you need to subscribe to the service which starts from $5 dollars. If you’d like to find out more about the wireless version of this camera, then here’s the link to it over on Amazon. The Nest IQ cam is designed with an all-glass lens and it is the next generation of the security camera. The 12 cm tall and 7cm wide camera has a 2.5 inch 8mp (4k) color sensor with the ability to digitally zoom 12x. The camera operates at 1080 at 30 frames per second. It also features 3 microphones which are able to add noise cancelations and suppression to your record. It also has the HD talk and listen feature which allows the user to hold 2-way conversations, which is great when talking to loved ones or kids. The Nest IQ is capable of operating in temperatures as low as -5°C to Temperatures as high as 45°C. At night, the camera has eight Infrared LEDs to help illuminate things in dark or low light conditions its 950mn infrared wavelength makes it a reliable security protector at night. The Camera is capable of using AI to distinguish between a person, an animal or a thing and to alert you accordingly. It also has the super sight feature which makes it capable of zooming into an object or close tracking an object in its vicinity. It also has a 130-degree field of vision and facial identification capabilities, which means it can tell if the person you are seeing is a familiar face or a stranger. One great feature of this smart camera is that it allows you to do 24/7 live videos, as well as a 3-hour capacity snapshot history. Apart from sight capabilities, the camera has near-unlimited storage capacity. The user has the opportunity to record files 24/7 for 30 days. Also, it has its intelligent alerts which can be connected to your smartphone or PC. It also allows the user to create and share clips and time lapses of footage. The device also has its own specially built in google assistant. Like all the other Nest products, the device is capable of working with a range of smart home products like the Philips Hue Lighting system, Wemo, or TP-Link Plugs to make your smart home more comfortable. It also allows you to create routines where when the camera senses motion it can turn on the lights. The Major problem with this camera is the limited mount option. The Nest IQ is made so that it can only be mounted on a flat horizontal surface. If you want to mount it on any other kind of surface you would have to buy a third party mount surface. This camera is a powerhouse, but very expensive. While it is packed with a whole load of features it is not very affordable and out of the price range of a lot of people. In addition to the camera itself, the software that the user needs to be able to use the cam, Nest Aware requires a monthly plan which can be cost prohibitive in itself. If you’d like to check out more of the technical specs or reviews then you can find these cameras over here at Amazon as well. Nest cam outdoor is one of the notable devices in the affordable, yet, valuable categories of security cameras. The camera is 2.8X 2.8X 3.5 and weighs 313grams. The wireless device also features a 3MP lens and 8x zoom. It has a 130-degree field of view and IP65 water resistance. The camera which is designed to be used outdoors temperatures as low as -4°F to Temperatures as high as 104°F. It is very affordable too, going for as low as $170 depending on the place of purchase. Once you connect to the Nest Aware software plan, you will find that the camera has near-unlimited storage capacity. The user has the opportunity to record files 24/7 for 30 days. Also, it has its intelligent alerts which can be connected to your smartphone or PC. One nice feature is that it allows the user to create and share clips and time lapses of footage. The device also has its own specially built in google assistant. Apart from this, like all the Nest IQ, the Nest outdoor is capable of working with a range of smart home products from lights security locks. The major con that this camera has that it is only designed to work outdoors, so even with all the features it has, if you are not looking to install the camera outdoors then it is not for you. The Nest cam outdoor does not have the special capabilities of its more expensive variant, for example, it does not have the AI capability to distinguish between a person, an animal or a thing and to alert you accordingly. It also does not have the super sight feature which makes it capable of zooming into an object or close tracking an object in its vicinity. It also doesn’t have facial recognition capabilities, which means it can tell if the person you are seeing is a familiar face or a stranger. This also lacks the ability to do 24/7 live videos, as well as a 3-hour capacity snapshot history the Nest IQ gives you. Here’s the link to the Nest Outdoor Cam over on Amazon if you’d like to check out more reviews. It can’t be overemphasized that having a smart security camera is important if you want your smart home secure, especially when you are away. If your current security camera is unable to provide the security coverage you need in your smart home, you should consider getting one of the cameras listed above. After checking the pros and cons of all the smart security cameras discussed above I think you will agree that to ward off intruders is easy. Thus, it is wise to buy one of these top-class security cameras. If you asked for my opinion I would say you should not think about their prices, but their benefits in having a secure smart home.